The flavonoids present in this formula are the most potent natural antioxidants available. Can be used throughout the year to help support and maintain the immune system. Pleasant tasting and comes with its own measuring cap. Free from artificial colours. Sambucol® has been laboratory tested. Glucose syrup, purified water, black elderberry extract juice (Antivirin), Vitamin C (ascorbic acid), acidity regulator: citric acid, preservative: potassium sorbate. Children 1 - 6 years: Take 1 teaspoon (5ml) daily. Children 7 - 12: Take 2 teaspoons (10ml) daily. Children 1 - 6 years: Take 1 - 2 teaspoons (5-10ml) twice daily. Children 7 - 12: Take 2 - 3 teaspoons (10-15ml) twice daily. Caution: In the event of a fever or other persistent condition, consult a healthcare professional. 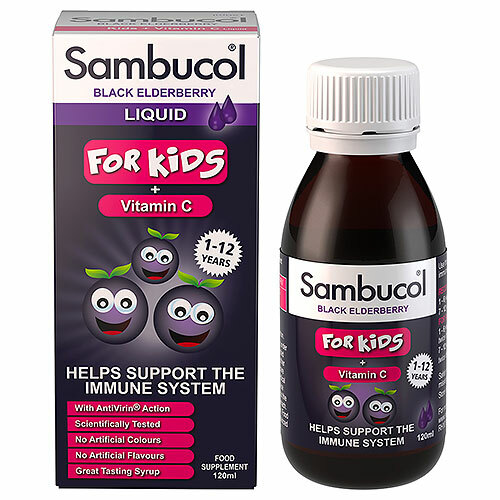 Below are reviews of Sambucol for Kids - Black Elderberry + Vitamin C - 120ml Liquid by bodykind customers. If you have tried this product we'd love to hear what you think so please leave a review. I initially thought this was probably another product designed to take money out of a parents pocket for no good reason...but I have to say it works. I have a vulnerable daughter and this stuff is the one thing that keeps many bugs at bay. She suffers from far less colds, has stopped getting chest infections and seems generally all round better for the sake of this stuff. It really does work and I'd have never believed it until having used this for a year and seeing the difference. Tried this as an alternative to the pukka herbs. My son does not seem.to like the taste of this much and it is quite high in sugar so this is not for us. This product is fantastic, my 2 year old son was getting illness after illness and was so run down with it all I was recommended this from someone in the supermarket. The first week of having this he was back to his normal self, and since then anytime he has a sniffle or cough within a day it has gone. Its great stuff highly recommended. The flavonoids present in this formula are the most potent natural antioxidants available. Can be used throughout the year to help support and maintain the immune system. Pleasant tasting.